This innovative story infuses Clement C. Moore’s classic poem with traditional Gullah folklore and characters. Traveling through a coastal South Carolina town, Buh Rabbit delivers his presents to all of the good boys and girls. Santa never contends with a villain as he makes his rounds, yet, following Gullah tradition, Buh Fox has his mouth set on rabbit for dinner and his eyes set on the presents. The result is an action-filled Christmas Eve that children will never forget. 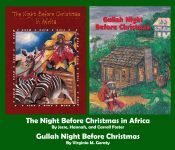 This is the only Christmas book written for children in Gullah, an English-derived Creole language spoken primarily by African-Americans along the South Carolina and Georgia coasts. Gullah continues to gain both national and international attention and appreciation as people are exposed to its rich language and the folklore and customs associated with it. Virginia Mixson Geraty is the world’s foremost authority on Gullah and one of the few people who has mastered the art of writing the language. In addition to serving as Gullah consultant for the British Broadcasting Company on the “Story of the English Language,” she is also a Gullah instructor at the College of Charleston, where she received her doctorate in humane letters. 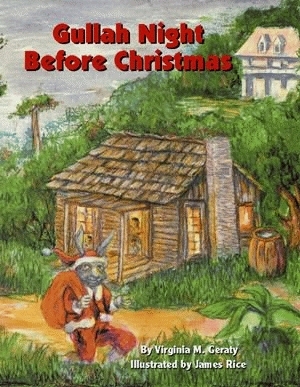 James Rice, in his long, distinguished career as an author and illustrator, has produced nearly fifty children’s books, among them the first of this series for Pelican, Cajun Night Before Christmas, in 1973. With more than one million copies of his books in print, he ranks among the nation’s best-selling creators of children’s books.